Corruption is a dirty word. The very definition of it is contested, its existence constantly denied and when you get close to shedding enough light on the issue, darker shadows appear. Working in the field of anti-corruption exposes you to great acts of courage and cowardice, as players on both sides manipulate axes of power to tilt the scales of justice. If it is individuals, an organization, nation or region one constantly witnesses a tango between those that push to instil strong institutions, transparency and the rule of law and those that thrive off institutional fragility, opacity and illegal practices. There is no global recipe for fighting corruption, but the good news is a model is starting to form on how policy reform, innovation and leadership together can raise levels of trust and lower corruption. We know that “corruption both feeds on and is fed by the broader crisis of trust, which sustains a vicious cycle that undermines economic health and social cohesion.” We also know that anti-corruption efforts that are implemented primarily for political reasons or target just one particular stakeholder are destined to fail and contribute to the widening global trust deficit. Nowhere is this struggle more prominent than in Latin America which continues to be rocked by scandals and where corruption currently ranks among the top three most problematic factors for business leaders in three of the four largest economies in the region. Yet what is striking about this region is that the most recent anti-corruption demonstrations rocking Argentina seem to be taking place under a different and defiant atmosphere, one tilted towards renewed trust to address corruption. 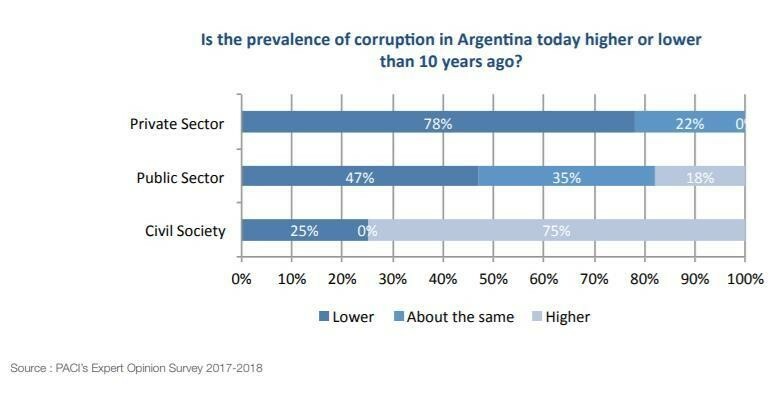 A recent white paper on the Future of Trust and Integrity by the World Economic Forum’s Partnering Against Corruption Initiative (PACI) found that Argentina is experiencing a positive upward trend in trust by key sectors of society, which is leading to perceptions of reduced corruption. Indeed, approximately 78% of business leaders have perceived a drop in corruption in the previous decade, and almost 90% anticipate further improvement in the next 10 years. 1. Upholding Legal obligations and the rule of law are seen as a foundation of trust and integrity by both public and private sectors as the most important indicator of stability and growth. In Argentina, the Anti-Corruption Office developed corporate liability reform legislation in 2016. Argentina’s Corporate Liability Law establishes corporate criminal liability for active, domestic and transnational bribery, trading in influence and other corruption offences. 2. ‘Leading by example’ is considered the most important role of leadership in ensuring integrity. Argentina’s administration under President Macri has publically denounced corruption and demonstrated commitment through ongoing policy reform. Under the G20 Argentine Presidency bright lines of collaboration to drive the anti-corruption agenda were drawn when the B20 and C20 signed two joint statements calling on all G20 countries to implement anti-corruption plans and increase integrity in State Owned Enterprises. 3. Technology has emerged as one of the greatest allies of transparency and a critical tool against corruption. Argentina is leading in digitalizing and modernizing its public administrations. However, while emerging solutions such as blockchain, open data, e-governance, and Artificial Intelligence have enormous potential to help build accountability and transparency, trust in these technologies still varies significantly across stakeholders. 4. Bridging the divide between institutional instruments and ethical behaviour. Although overall Latin American countries have robust corporate governance standards, these institutional mechanisms are not always translated into a sense of ethical behaviour. While new legal requirements such as the Corporate Liability Law in Argentina reinforce standards, bolstering legal enforcement is not enough. 5. Moving from a stick to a carrot. Providing a spotlight for examples of positive action and leadership boosts values and culture. Anti-corruption initiatives often focus on identifying and prosecuting those involved in bad practices, but it is equally important to highlight success stories to foster greater trust. 6. The need for increased collective actions across industries. One of the biggest concerns for private-sector entities is to level the playing field on which they compete, joining forces with industry partners, pooling of resources and enhancing bargaining power to resist attempts at extortion. Argentina has demonstrated emerging success in this area; however business associations and exposed sectors involved in public procurement can do much more. South Africa, Mexico, South Korea, and Malaysia, to name a few, have recently elected governments on the back of promised anti-corruption reform. Likewise, Saudi Arabia, Nigeria, France and the United Kingdom are invigorating anti-corruption plans. As we witness such momentum government and business leaders have a significant opportunity to rebuild trust and address corruption. Yet it is also the window where short-term measures and mis-judged reform can bring heightened distrust, instability and a loss in market confidence. What we do know is that successful policies that reduce corruption will have a direct effect on growth as well as an indirect, and perhaps even stronger, effect through the building of trust. Leaders will continue to watch Argentina to see if the vicious cycle of dis-trust and corruption has been broken and a new era of trust and integrity is ushered into the light.